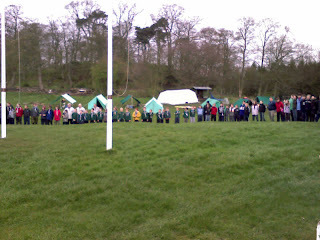 Above : So many at flagbreak they couldn't all fit in the photo! Probably the busiest weekend this year with around 600 people visiting the centre over the weekend - 300 residential and another 300 (mostly beavers) having a day visit. 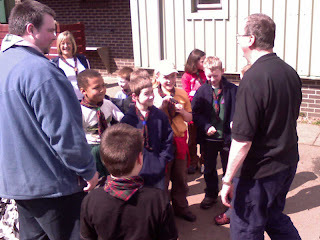 There were 13 groups with the largest being Rosyth District who held their annual St George's camp. 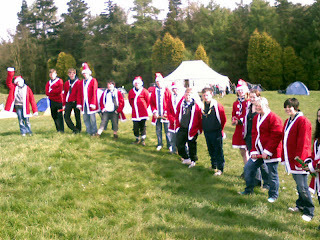 Fancy dress seemed to be a popular theme for some reason, with some close competition between the local (cub) sea scouts who spent the whole weekend in a second world war theme, and the local explorers who had not one but four separate disguises for the weekend, including santa ones. The staff had a great start to the weekend with a huge cooked breakfast on saturday morning - unaware that they had accidentally eaten all the Exporers' sausages which they had been keeping in the staff freezer. 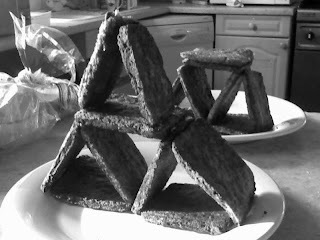 After everyone had finished laughing about it (except the explorers of course), a trip to Tesco was made to replenish supplies. 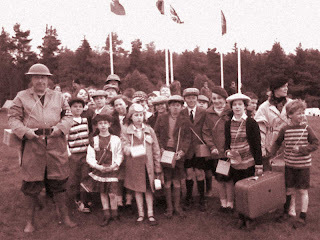 Above : Due to a slight calendar problem, the local explorers turned up for their Christmas party exactly 8 months early. Note hungry look on their faces from lack of breakfast. After a full day of activities, most of the groups attended a campfire whilst the staff held the Fellowship AGM in the reception building. In traditional form, there was a review of the past year by committee members plus Bob, followed by the election of a new committee for the following year. One X-factor-style voting session later, a new(ish) committee was in place and it was time to relax, indulge in the buffet and socialise for a while (until it was time to clean the toilets). The new committee will look after a huge range of tasks on behalf of all the volunteer staff, including finance, recruitment, publicity and organising various events. 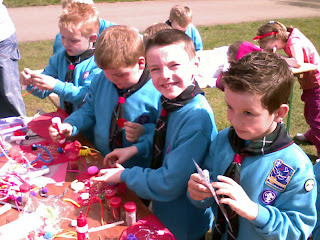 Above : Beavers busy preparing their entry for this year's Turner prize. 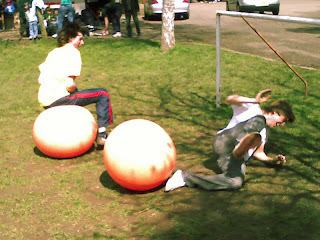 Above : Blair Atholl selection day - spectacular accident during spacehopper race.